ALOHA! Lang, um weg von der Hektik zu bekommen? Sind Sie bereit, sich zu entspannen? Dann willkommen im Paradies! Wenn Sie lieben, Kauai, wie wir tun, Sie lieben Aufenthalt in unserem Strandwohnung in Kapaa. Wir sind auf der dritten (obersten) Stock (mit Aufzug) in einer Sitzecke mit freiem Blick auf Nord-Süd und Ost. Wunderschöne Sonnenaufgänge von unserem Lanai (Balkon) und Blick auf den schönen Meile langen Sandstrand mit seinem Wandern, Joggen, Radweg. Das Pono Kai Resort befindet sich direkt in der malerischen Stadt von Kapaa. Sie sind zu Fuß von vielen Geschäften und Restaurants, aber sind von der Straße und Verkehrslärm von fünfzehn Hektar und mehrere andere Gebäude in dem Komplex abgeschirmt. Alles, was Sie in unsere Wohnung zu hören sind die hypnotisierenden Klängen des Ozeans und die Passatwinde Aufatmen durch die Palmen. This place is great if you are looking for a place right on the beach within close walking distance to the shops of Kapaa. While the place could use a little updating with respect to its decor, it is the great location and view that make it all worthwhile. The unit is quiet (except for the roosters which are noisy everywhere), clean, and well-stocked for your stay. The owner has beach chairs, a beach umbrella, and snorkel fins available in the unit, plus other items that will make your stay comfortable. 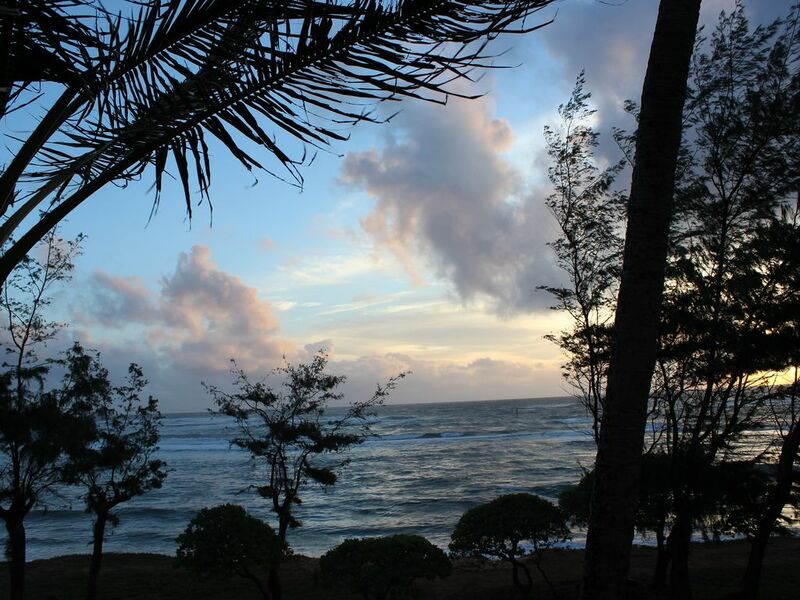 We heartily recommend this place for your next stay in Kapaa. Exceeded our expectations. Location Kaua’i. Location Kapaa. Location Pono Kai Resort and location an upper corner unit facing the beach. All great. No other resort area, or resort had the same ambiance. Ticked all the boxes for us - clean and well equipped (and that refers to all locations). The unit had everything you needed - to cook, entertain, go to the beach, whatever. It felt very comfortable - not sterile like some stainless steel/granite countertops places feel. Same with the resort - nicely designed and lots of nice touches without the dolphins in the reception area pool kind of nonsense. We’ll be back. And we’ll be telling our friends and family to do so as well. Thank you for your kind review of our apartment. We're glad you appreciated the "homey" way we've tried to make it feel. We, too, have stayed at some resorts that felt "Sterile." and that's one of the reasons we chose the Pono Kai Resort for our vacation home. Being in the senior citizen age and not that physically active we especially enjoy the lanai and location of this unit. The only complaint we really had was the television operation. We had to get help 2 or 3 times to get the television on. I finally was able to get it to work, but it was irritating. I think that there must be a simpler method to operating this system. I would recommend this property. We have been coming to Kauai for 20 years. This is a clean and enjoyable unit. This condo makes your vacation dreams come true! Top floor, views up and down the coast, you can hear the waves break all night long, and the view of the beach and ocean are 24-hour spectacular! For stays in excess of 20 nights: A deposit of $300 will reserve until 120 days prior to your stay, when one-half the balance is due. The final balance is due 60 days prior to your stay. For 2016 the Housekeeping Fee per stay is $105.00.